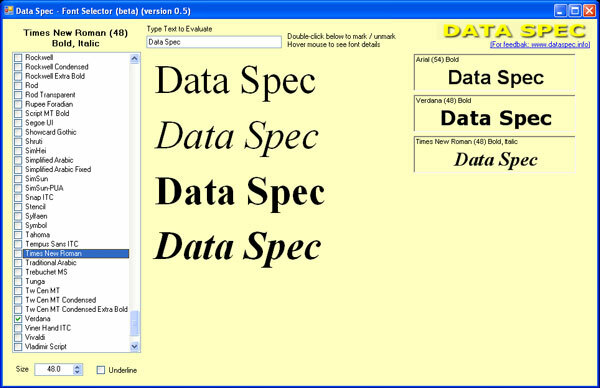 dsFont is a free utility for evaluating your text in different fonts at a time. The tool works supports unicode text and be used against any language / script. Data Spec's Font Selector is a simple yet effective tool that helps you to compare how a particular text will look in any font. Key in the text you want to evaluate. Select the font and size from the list. Double click on the text to bookmark what you like. The bookmarked font and text appears in the right panel. Scroll through the bookmarked items and click on it to bring it into the main view window. Double click the bookmarked item to unmark it.